Executive coaching from SurgingLife led by founder Stephen Frost brings you the opportunity for developing the balance of life and smoothness of doing business that you have been wishing for. This is a service that has been optimised for owners, entrepreneurs and executives who are doing their best and yet know that better is still possible. As Harvard Business Review says “Today, most coaching is about developing the capabilities of high-potential performers”. This is about eliminating stress, gaining clarity and developing yourself into a powerful magnet for the results you desire. It is also about more than these things though. To be truly successful you need to be able achieve great things of course and importantly you need to feel that success. Most importantly you need to be able to enjoy it. If you are chained to your work, over stressed or anxious as to what is coming next you are far from free to enjoy it, regardless of what else it brings you. Being able to create balance in your life that frees you to work at high capacity can help you reap great rewards in a state of joy. Being able to achieve a state of highly leveraged ability and efficiency such that even just small amounts of your time and energy produce great results offers greater rewards. All in a manner that has you feeling at peace with yourself and happy, that is when success is truly with you. You leverage other elements of your business. You leverage finance. You leverage peoples time. So leveraging yourself more effectively has got to be a wise thing to do. This is about unlocking your hidden powers. It is about optimising your mind and your psyche. When you commit to this program you commit to pulling back the shroud that had you held at marginal levels of effectiveness. Together with your coach you clear out that which held you back and develop a set of mental resources that empower you to the greater heights you seek. Is Executive Coaching Truly For You? If you had the power to completely change your life at will, in any way you desire, just by thinking it and clicking your fingers would you do it? Does that thought bring fear or inspiration? If it brings fear then perhaps you are as yet to become ready. If the thought brings inspiration then you likely are ready to move forward. If you do wish to move forward and create your life the way you imagined it then this is for you. Only if you are ready to commit and let go of that which held you back. This is a process of optimisation, and as with all such processes often there are things to let go of. It is through letting go that we gain the energy and ability to ascend in life. In working with your coach various things will come up for you, some you may already be aware of, others are yet to be uncovered. When these things come up you will be guided through special processes which empower you in a wonderful way. I first met Stephen in the UK where I approached him for a NLP session. This session came at a pivotal time in my life and Stephen's help and guidance was paramount in helping me implement many positive changes in my life. Stephen was extremely knowledgeable, caring, gentle, reassuring and insightful, I felt completely safe which is so important when embarking on any inner/soul healing work. I would recommend Stephen to anyone who is ready to move forward and make this lifetime count and become all you truly can be. Having Steve’s knowledge and guidance has helped me clearly focus on moving myself and the company forward. He ensured that the goals that we wanted to achieve were set out in a logical formula, which has started to unlock the potential for the company. With steve's calmness he talks and guides you in such a way that he doesn’t mesmerise you, he simply helps you unlock your true potential, enabling you to go on and dream the impossible and work towards achieving it. Through the techniques that Steve implements, the company is well on its way to achieving these goals. Making the decision to leave the safety and security of paid employment to set up my own company was one of the hardest yet most rewarding decisions I have ever come to. Steve provided support and encouragement to me over a number of months as I moved from the realisation that I was no longer feeling fulfilled by the role I was currently undertaking, to understanding that my values and beliefs were not being satisfied by the company I was working for. Steve then helped me face my fear of stepping into the unknown and making the decision not just to change my job, but to set up my own company. He helped me become aware of my need to direct my time and energies towards the companies and individuals I chose to work with, rather than have them dictated by revenue targets. Through Steve's continued coaching I developed the self-confidence to believe that I could successfully attract clients through my own credibility and no longer feel that people were working with me because of the strong brand reputation that my former company had. Setting up my own company has taken a lot of hard work to establish, however I am now benefiting from the flexibility, freedom and great work/life balance that it affords me, as well as fulfilling my wish to work with clients who are making a real sustainable difference to the world. Steve's patience, his ability to sensitively probe areas of incongruence and his dedication to helping me achieve my goals have been invaluable in making the transition successfully. Achieving any kind of results in life and business requires investment. Whatever you are doing, what ever the outcome you are working to attain, investment is required. That investment is always in some way proportional to the result you desire. Business deals, dating, learning a new skill or developing an ability, there is always something required from you such that you can achieve the outcome you desire. Often this is financial, there is also the important aspect of time too. The amount of time you put into something has a direct impact on what you achieve. The smaller the amount of time the lesser the result. The more you invest of your time the greater the result you achieve. Think about the figures for achieving true mastery in something. Whether it be racing, playing an instrument, analysing accounts and stocks, there is a widely acknowledged period of 20,000 hours of practice required to achieve that mastery. So the more time you invest in something the sooner you will gain the greater benefits. Likely the things you do best in business are the things you have been doing for a long time. Yet likely, if you are reading this, there is still potential for enhancing them. The depth of your relationships is dependent on the amount of time you spend with each person. Spend more time with your wife, husband, girlfriend or boyfriend invest time in being with them, knowing them and sharing good times with them and the relationship will deepen and become more rewarding. Spend more time with co-workers working diligently together in a co-operative atmosphere and you will deepen your rapport with them too. As a result you will achieve more together, and it will be and feel more rewarding. This can be directly applied to creating personal change and developing yourself through Executive Coaching. The amount of time you spend working together with your coach, and then importantly following through on what you have done together massively impacts on the rate and depth of the results you achieve. Does this have to be a huge amount of time? Potentially, finding the right balance for you is important and that should be kept in mind. If you can leverage yourself more effectively, if you can clear away stress, if you can gain the greater clarity which enable you to work effectively such that you achieve more with less time investing a good portion of your time has got to be worthwhile. Every coaching session will leverage your ability higher. Every issue you clear will leverage your ability higher. Every belief change you effect with your coach will leverage your ability higher and the success you desire will come with greater ease too. Pause for a moment. Bring to mind the picture of exactly how you wish your life to be. Allow thoughts of the ideal to come into your mind. Relationships, business, love, money, travel, everything that is important to you. Bring them into your mind in such a way that you can see, hear and feel your life in perfect harmony around you. The life which has you smiling with happiness and joy just from the thought of it. Now take a few moments to fully connect with it, close your eyes and just be with it. Now how would it be if that was your experience of living on a daily basis? Totally balanced in the way you wish it to be. Is that something that would have value for you? How much of your time would you be happy to invest each week or each month to actually achieve that in the here and now? If you could bring all of that out from your mind and manifest it in reality is that something that you would feel happy to invest in doing? How much time would you be willing to take each week and each month to actually achieve that vision? Do you need to commit a huge amount of time every day to achieving your ideal vision of life in all its glory? You might be surprised to discover that with the right coach you can leverage about 3 to 4 hours a month to achieve amazing results. The key point here is that that coach has to be using very specific techniques that are optimised for getting you deep results that last in a compressed amount of time. You are leveraging your coaches expertise so that you achieve a greater amount from your investment of time and energy. Something that can pay you back big time. All SurgingLife executive coaching packages are monthly with pricing on application. Everything in life has an ROI. It is a universal law. What you get out is proportional to what you put in. You leverage resources of time, money and expertise to increase your return, this you know well. The question is what ROI do you wish to attain from your Executive Coaching sessions? 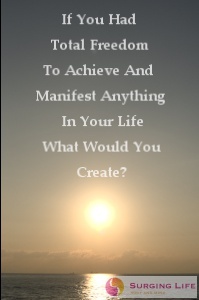 What are you going to commit to putting in such that you achieve your desired outcome, or even surpass it? Once you have decided what you are prepared to put in and commit to time wise then feel free to get in contact and arrange an initial consultation session at a time convenient to yourself. Are You Ready To Achieve Clarity And Magnetize Yourself To Success? Please only contact us if you are ready to commit to a program that can transform your ability to achieve and fulfil your potential in and amazing way. The door stands before you open and ready for you to go through it. What lies beyond is opportunity across the full diversity of things which you wish your life in all its glory to be. Once you commit to achieving the outcome you desire the Executive Coaching you get from SurgingLife and Stephen Frost will aid you flow to that achievement in an ever easier way. Commit to yourself, invest in yourself, discover that which will carry you smoothly to manifesting your vision and do it joyfully. Peace and fortune be with you, we look forward to working with you soon if it is the right thing for you.